The Jerusalem Biblical Zoo, also known as the Tisch Family Zoological Gardens, and the adjacent Israel Aquarium are holding their own mock election Tuesday simultaneously with Israel’s general election. Polls opened at 9 a.m., and visitors will be able to vote for their favorite candidates among the zoo’s permanent residents until 6 p.m. The election was first announced in a Facebook post and video published by the zoo last week, in which various candidates share the pillars of their party platforms—the kangaroo party promises to fill voters’ pockets; the elephant party claims there is an elephant in the room and it is the only one who could stop a potential missile attack; pandas, flamingos, red-handed tamarins, and fallow deers joined forces to form a single party promising to keep things fun; and the zebras and zebra sharks party promises to keep the “sea of politics” clean. Unlike in the general election, all visitors to the zoo and aquarium are eligible to vote regardless of age or nationality. This is not the first time the zoo catches political fever. 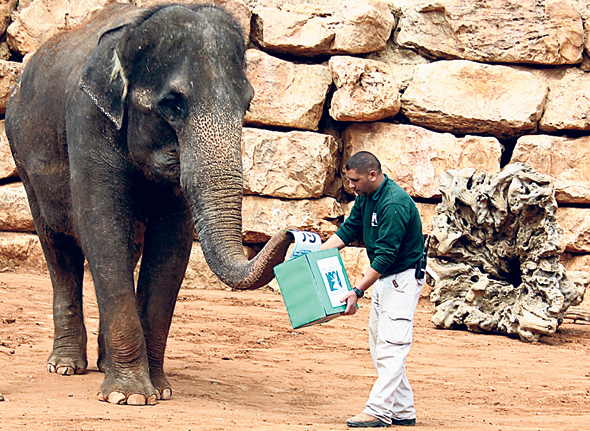 In October, during the statewide municipal election, a similar campaign ran at the zoo. 693 votes were cast and Ziv the lion won the mayorship. The rhino party was the second largest with 17% of all votes, and the kangaroo party came in third with 14%.